for the Junior and Senior team for the forthcoming season. teams playing in various levels of leagues. CD Phoenix Sussex NC is holding trials for our South Region Squads in the Sports Hall, at Copthorne Prep School, Effingham Lane, Copthorne, West Sussex, RH10 3HR. CD Phoenix SR Open Squad, are in Division 2 in the South Region League, the squad finished this year in, a well deserved, fifth place. Full commitment to training sessions and participating in matches around the South Region, BMW League matches, EGNL Summer League and tournaments is required from players. Regional matches will be played on Sundays and training sessions take place on Thursday evenings. The squad’s objective for the forthcoming season will be working towards promotion to Division 1. We are also looking to develop our second team with the aim of moving up into Division 2 of the South Region League. During the season we hope to have movement between the two squads as players compete for positions. This team will play in the EGNL on Monday nights. Training sessions from April to November are held at the G4S Netball Centre at East Grinstead Sports Club, and throughout the winter at indoor locations around East Grinstead. A. Polley, CD Phoenix Sussex NC, 6 Rowplatt Close, Felbridge, East Grinstead, West Sussex, RH19 2RJ. Please note trials for existing club players will be by invitation. CD Phoenix Sussex NC is holding trials for our South Region U19 Squad in the Sports Hall, at Sackville School, East Grinstead, West Sussex, RH19 3TY. CD Phoenix U19 Regional Squad, will be competing in the Regional Qualification Tournament on the 7th and 8th September in order to secure a place in the South Region U19 League for 2013/14. Full commitment to training sessions each Thursday from 7.30pm until 9.15pm and participating in 14 matches around the South Region (Sundays), EGNL Winter and Summer League (Mondays) and Tournaments is required from players. J. Evans, CD Phoenix Sussex NC, 26 Hophurst Drive, Crawley Down, West Sussex, RH19 4UZ. CD Phoenix Sussex NC is holding trials for our South Region U16 Squad in the Sports Hall, at Sackville School, East Grinstead, West Sussex, RH19 3TY. CD Phoenix U16 Regional Squad, will be competing in the Regional Qualification Tournament on the 7th and 8th September in order to secure a place in the South Region U16 League for 2013/14. Full commitment to training sessions each Thursday from 7.30pm until 9.15pm and participating in 14 matches around the South Region (Saturdays), EGNL Winter and Summer League (Mondays) and Tournaments is required from players. Mrs R. Lewis, CD Phoenix Sussex NC, 1 Butterfield, East Grinstead, West Sussex, RH19 2BF. Open trials will be held for our junior age group teams at the G4S Netball Centre, East Grinstead Sports Club, Saint Hill Road, East Grinstead, RH19 4JU. Junior Leagues – All age groups. Teams will be entered into the Sevenoaks and Surrey leagues, players will need to be available on Saturday mornings from September to April, and 4/5 Sunday mornings from September to March. Sussex Junior League – All age groups. Players will need to be available to play in a Sussex venue for 6 Saturday mornings from September to April. East Grinstead Senior League – Players of 14 years and upwards will need to be available to play on Monday nights from September to March (Winter League) and from May to July (Summer League). Tournaments - will be entered throughout the year and commitment to player’s teams at both home and away tournaments is expected. IMPORTANT NOTE: Players will be expected to commit to regular Thursday training and participate as regular team members in league or tournament matches. Attendance at training is a requirement for team selection. Availability for match play will be a key requirement in team selection. Following trials there will be a coaches meeting to discuss each individual player’s selection. Each player will then receive a letter stating which team they have been selected for, and the relevant details. Players will not be advised of team selection directly following trials. Further trials may be held during the season, following which, there may be movement between teams. Would current Club members please complete the attached form and return it to your coach or team manager. This was Silvers first ever 7’s game having played High 5’s in all their previous matches but off the back of their recent tournament win at High Wycombe the Silvers were in a confident mood and this showed in the first 3 games, winning all 3 without conceding a point or even a shot (8-0, 6-0, & 4-0). This was followed by 3 more group games all of which were won (5-1, 6-1 & 4-1). Silvers finished top of their group which included teams from Essex Open, Brentwood and Watford with a record of played 6, won 6, 33 scored and 3 against. The first stern test came against Poole in the semi-final, initially 3-0 up and cruising, Silvers conceded 2 quick points enduring a nervy 2nd half before making 4-2 in the last minute to progress into the final to meet the hosts Turnford. The final was tight and Silvers scored first but Turnford responded with 3 quick points to go 3-1 up. Silvers then fought back to 3-3 but it was Turnford who managed the winning point in the last minute condemning Silver to their first defeat in 7 months. 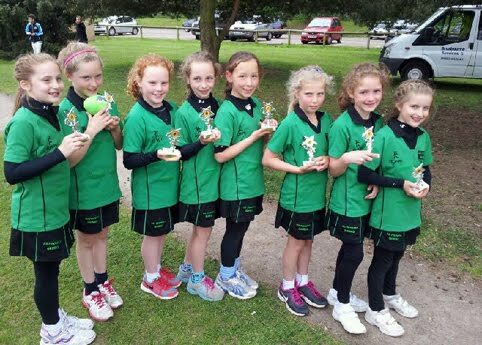 Under 10's Tournament Well done everyone in Under 10's for winning the tournament last week! Keep up the good work! The clubs main training sessions are on a Thursday and teams train outdoors at G4 Netball Centre, East Grinstead Sports Club, Saint Hill Road in summer months and at a variety of local indoor venues in the winter months. Training session times vary according to player age. Under 11/15 - usually commencing at 18:00.